Naoshima is the most familiar of the Seto Inland Sea "art islands". You've seen it on social media from tourists' posing in front of the yellow, polka-dot pumpkin. As necessary it is to pay homage to the great pumpkins of Naoshima, the Seto Inland Sea experience won't be complete without including Teshima and Inujima. These two islands (among many) are apart of the Setouchi Triennale (the next one is in 2019). If you have any inkling of interest in art then these islands should be a priority slipped into your typical Tokyo-Kyoto-Osaka JR pass itinerary. If you're a seasoned traveler you will be able to check off Teshima and Inujima in one day. If you like to take the slow course, consider one day per island. To make your life easier, you should choose your accommodation in Honmura (Naoshima) to be close to the ferry and convenience. For those traveling on a budget and can't ball out at the luxurious Benesse House, there are several great lodging options offered in the local village. Yado Seven Beach is an excellent accommodation as a base with the friendliest staff to boast. 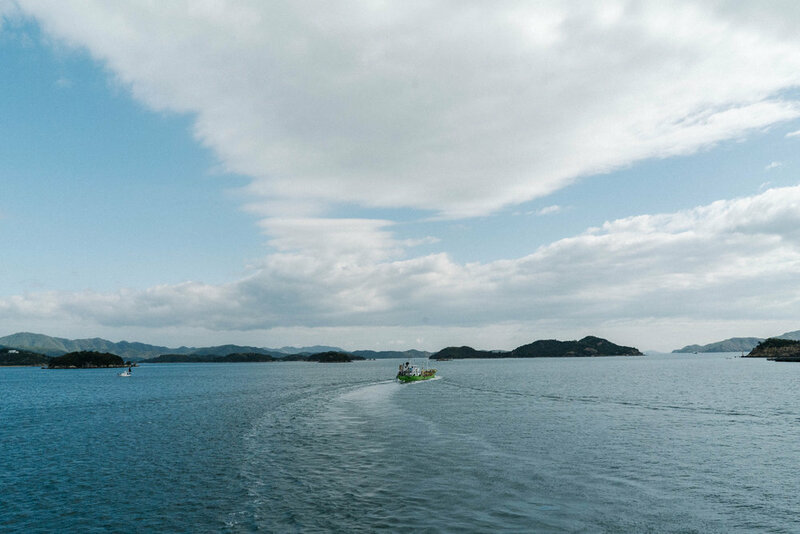 Assuming that you have experienced at least a day on Naoshima, you will start your day early to catch one of the first ferries to depart to Teshima via Honmura Port. The recommended first ferry out of Naoshima via Honmura Port is at 9:20AM and arrives in Ieura Port in Teshima at 9:42AM (*times from when written in 2018, check for the most updated timetable at the information desk at the ports). There is a bicycle rental shop as soon as you exit the port. Cycling across the island is recommended for a more intimate experience of local life and the outdoors. Your first main destination should be the Teshima Art Museum. The museum is a 15-20 min pedal to the east side of the island. 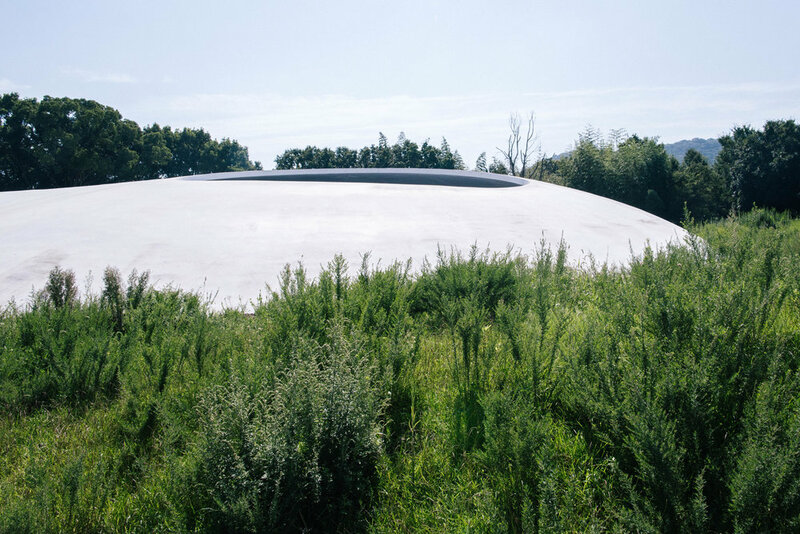 Teshima Art Museum exists in the form of a water droplet landing which denotes to the experience of the exhibition itself. Its not your traditional museum with paintings and sculptural works displayed. The space and experience is designed by Pritzker Prize-winning architect Ryue Nishizawa and artist Rei Naito. Together they create a purely meditative nature-mind-visual encounter that can't be reported in literal form. The experience is one of those rare situations when you'll forgive the tiresome no-photo policies that are enforced at Japanese institutions. The mere thought of taking a photo in the space feels utterly intrusive and aggressive, as the sound of rushing droplets of water resonates across the dome interior. If you sit there shoeless, in the cement dome long enough, taking in every droplet of water, every change in natural light, a sort of spiritual calm washes over the mind. Its a spiritual experience without being preachy about anything in particular. For an easier navigation, grab a map of the island from the visitor center. By making your way back to the Ieura Port area you will be able to catch several spots before the ferry ride. Pop-Surrealist artist/graphic designer Tadanori Yokoo and architect Yuko Nagayama have collaborated in creating a museum by renovating an old house. The museum houses Yokoo's rebellious and psychedelic work that freaked people out in the 60's. A museum with just work on the walls wouldn't fulfill an Yokoo experience. The museum has wacky mirrored bathrooms to perception-defying rooms all in the taste of Yokoo. Anyone interested in visual art and graphic design should make a stop at design god's psych house. The ferry from Teshima will take you to Inujima. Following the Teshima + Inujima day trip schedule, you will be required to catch the ferry that will give you ample time to sweep through Inujima. The 12:25pm ferry bound for Inujima is recommended. This will give you enough time to explore Inujima and make it back to the 3:20pm ferry bound for Naoshima. Inujima's main points are Inujima Seirensho Art Museum and the "Art House Project". Inujima Seirensho Art Museum created a future and renewed purpose for a former copper refinery that was active in the early 1900s. The abandoned copper refinery was resurrected by architect Hiroshi Sambuichi in collaboration with exhibiting artist Yukinori Yanagi. When you think of all the grand museums of the world, you will expect a high energy consumption and heating facility. Inujima Seirensho Art Museum relies only on natural and renewable sources. The museum retains its temperature through geothermal methods through solar energy. Air flow and circulation is controlled by the Chimney Hall which serves as the museum's central point. The sophisticated water purification system employs the use of power from the vegetation that were planted to suit Inujima. The works of Yukinori Yanagi are exhibited with Japan's national legend Yukio Mishima as a motif, a vocal critique of Japan's modernization during the industrial period. The works are exhibited in six spaces each with its own unique experience that are inseparable with the architectural features. The "Icarus Cell" takes you through a windy zigzagging corridor with mirrors with reflections of natural light from a shaft. With sounds and force from the wind and inching your way closer to the light source (the sun), you are fully engaged in this work. The rest of the works are directly centers around Yukio Mishima as Yanagi exhibits a work that collages Mishima's deconstructed home which lightly sway as gusts of winds pass through the museum. Though a different experience from the Teshima Art Museum, you gotta see, feel, and hear it to believe it. While the world keeps talking about sustainability, here is a perfect leading example of a recycle-society while retaining its industrial heritage and environment through art and design. The "Art House Project" features six locations where artwork is created in the local community of Inujima with its natural environment in mind. The sites include A-Art House, C-Art House, F-Art House, S-Art House, I-Art House, Former site of a stonecutter's house, and a rest area-Nakanotani Gazebo. The points are scattered around the island with a pleasant visual impression with the placement and consideration for the community. They need to be experienced first hand for full impact as with everything on the islands. Navigating Inujima is fairly simple with most points accessible on one route. The beautiful retrofitted Ukicafe is out of a Miyazaki movie. The cafe stands with most of the original architecture intact which creates a homie and relaxing atmosphere. Those not familiar with local mom and pop eateries will feel like they're intruding someone's home. Well, that's because the establishment might just be the owner's residence with his living quarters upstairs or in the back of the house. Enjoy it because these kinds of places serve the best food and nostalgic flashbacks to take home. Ukicafe offers tea, coffee, desserts, pastas and other rotating items using locally sourced ingredients. There are other great options around town. Grab an Inujima bowl (minced sole over rice) at Arimoto Shoten, seafood at Sato-Sun, curry at trees Inujima, seasonal dishes at simasima, Japanese and Western offerings at Shima Shokudo, and of course a menu of locally sourced ingredient cooking at the ticket center. On your rush back to the Inujima Port you'll come across local houses and small businesses. 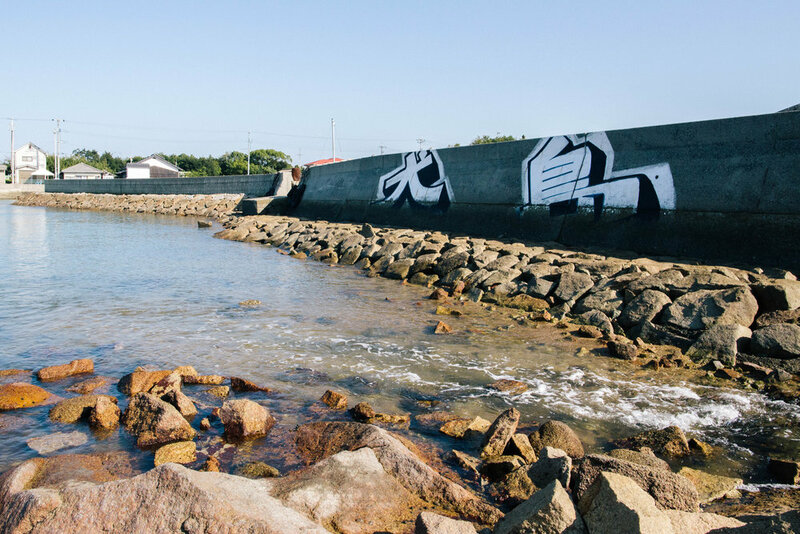 A large mural of "Inujima" faces the sea on your last stretch to the port. Tokyo/Osaka/Kyoto bound folks will depart via Honmura Port in Naoshima. If the experiences from the Seto Inland Sea islands had any kind of effect on you, you will seek out other countless less visited destinations of Japan.